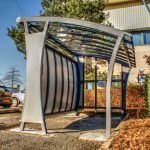 Our design team enjoy creating attractive and useful outdoor shelters to suit our clients’ varying needs. 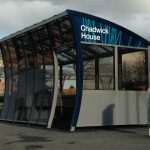 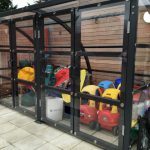 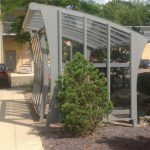 It may be that a user wants to lock away their nursery play toys at night, or they require something a little more sophisticated than the norm for bus shelters on their business park. 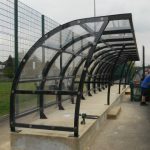 Perhaps they need a bicycle or smoking shelter, or somewhere to protect spectators at the side of a sports field. 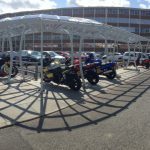 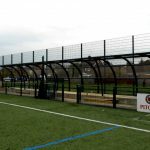 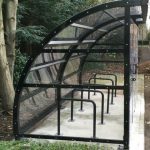 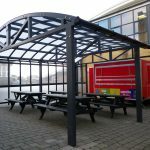 Our covers have also been installed as outdoor eating enclosures at schools – costing far less than a traditionally built dining room and being much quicker to erect and, therefore, utilise. 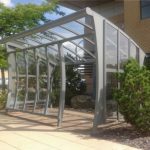 Using aluminium for the framework is our material of choice as it is such a versatile metal. 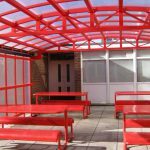 It can be formed into many shapes, it is relatively light in weight, making it easier and safer to handle and install, it won’t rust in use and once powder coated it retains its good looks. 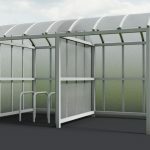 It is also one of the greenest products around – approximately 80% of the aluminium in use today has been recycled at least once, and it can be recycled again and again without losing its many properties. 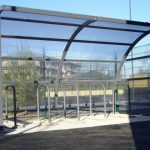 We generally glaze our shelters with polycarbonate, either solid or multiwall, depending upon whether light and/or visibility are required. 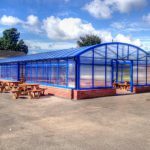 Incredibly tough and virtually unbreakable, polycarbonate is available in a range of tints and colours. 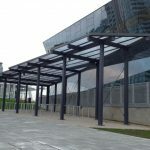 Sometimes an aluminium cladding product may also be incorporated in the design to help accentuate a shape or to replace glazing in a vertical application where visibility is not required. 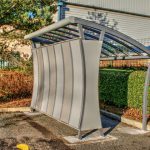 All of these products lend themselves to attractive curved shapes, which have an element of self-cleaning in rain. 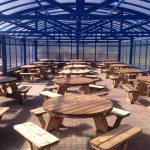 For those who are looking for an elegant, useful and functional outside glazed cover the Twinfix design team await the challenge!